You might want to find something to plug your bowels as you’re probably going to lose control of them once you hear the following revelations. Those prudent, thrifty Sheikhs over at Manchester City have today filed their financial results for last year (meaning that this summer’s massive outlay on the likes of David Silva, Mario Balotelli and Yaya Toure is not taken into account), announcing that the club has ‘suffered’ record losses of £121.3 million. 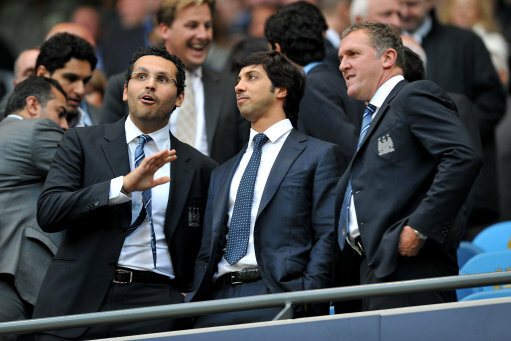 Owner Sheikh Mansour and the Abu Dhabi United Group have revealed that City’s annual wage expenditure in the same period was £133.3 million, whilst their group turnover was only £125 million which, if the club was rooted in any kind of reality, would be completely unsustainable. “Two years ago I was fortunate enough to become part of the Manchester City story and I remain grateful for the warmth of the welcome that you have given me. The ownership of a club like Manchester City, with such a rich heritage and diverse community of stakeholders, carries a unique set of obligations to the fans, staff and broader Manchester community. This is something I do not take lightly. What’s £121.3 million amongst friends? Amongst the monolithic losses, City have enjoyed a swelling in particular aspects of their financial ongoings. Turnover has increased by 40%, and their ‘commercial activity’ has more than doubled to £52.8 million – showing that the club’s global standing is steadily increasing. For mansour it’s no loss.